This diet is derived from one once given at the Sacred Heart Memorial Hospital for overweight heart patients to lose weight rapidly, usually before surgery. Modifications have been added by Ed Kasper L.Ac, Acupuncturist and Herbalist. expect to lose 10-17 pounds in one week. Kombu (seaweed) and Shitake Mushrooms are available in the oriental section of most markets. We do not make any recommendations or variations on this diet and it is meant only to be used for the seven days and to help prepare one to lose weight safely before surgery. It is not meant for long term or repeated use. 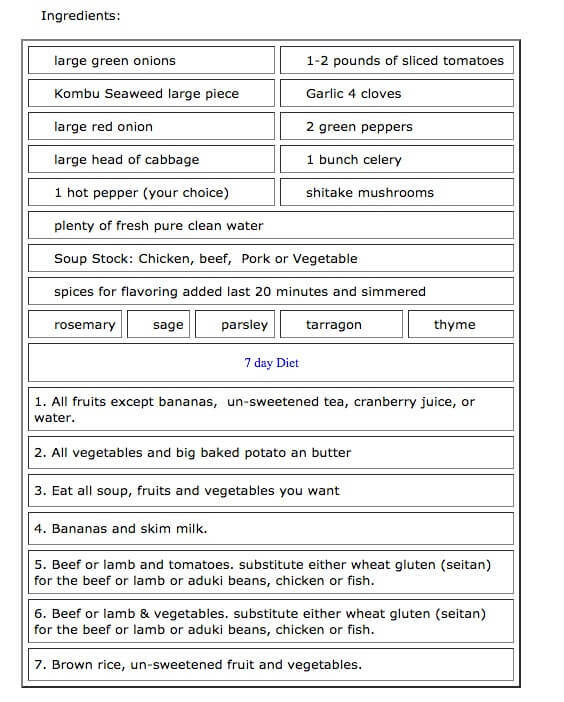 For unknown reasons this recipe is no longer used at the hospital. Many people have told us that it worked well, but they wanted to continue to use it - which as we understood was not the intention of the receipe. Many folks have also told us that they made changes for one reason or another. There are a zillion diet recipes out there an dw ebelieve this is a safe and effective quick weight lost recipe but please do not abuse it. Cut vegetables in small to medium pieces, sauté in olive oil & cover with water. Boil fast for 10 (ten) minutes. Cut to simmer & continue cooking until vegetables are tender. This soup can be eaten any time you are hungry. Eat as much as you want, whenever you want. This soup will not add calories. The more you eat, the more you will lose. Fill a thermos in the morning if you will be away during the day. If eaten alone for indefinite periods, you would suffer from malnutrition. Drink plenty of fresh pure water all day. Drink 1/2 of your body weight in ounces of water. If you weigh 100 pounds then drink 50 ounces of water. Distilled Water will pull more toxins, waste and unused minerals and stuff out of your body, allowing more room for healthy nutrients. DAY ONE: All fruits except bananas. Cantaloupe and watermelon are lower in calories than most fruits. Eat only the soup and fruits. For drinks - un-sweetened tea, cranberry juice, or water. DAY TWO: All vegetables. Eat until you are stuffed with all the fresh, raw or canned vegetables. Try to eat leafy vegetables and stay away from dry beans, peas and corn. Eat along with the soup. At dinner time on this day, reward yourself with a big baked potato and butter. Do not eat any fruits. DAY THREE: Eat all soup, fruits and vegetables you want. Do not have a baked potato. If you have eaten for three days, as above, and have not cheated, you will find you have lost 5-7 pounds. DAY FOUR: Bananas and skim milk. Eat as many as 3 bananas and drink as many glasses of water as you can on this day along with the soup. Bananas are high in calories and carbohydrates and so is the milk, but on this particular day your body will need the potassium and the carbohydrates, proteins and calcium to lessen your craving for sweets. DAY FIVE: Beef or lamb and tomatoes. Try to select high quality range fed animal protein free of antibiotics or hormones. You may have 10-20 ounces of beef or lamb and a can of tomatoes or as many as 6 fresh tomatoes on this day. Try to drink at least 6-8 glasses of water this day to wash away the uric acid in your body. Eat the soup at least once this day. You can substitute either wheat gluten (seitan) for the beef or lamb or aduki beans, chicken or fish. DAY SIX: Beef or lamb & vegetables. Eat to your heart's content of the beef or lamb and vegetables this day. You can have two or three steaks if you like, with green leafy vegetables, but no baked potato. Be sure and eat the soup at least once today. You can substitute either wheat gluten (seitan) for the beef or lamb or aduki beans, chicken or fish. DAY SEVEN: Brown rice, un-sweetened fruit and vegetables. Again, stuff yourself. Be sure to have the soup at least once today. By the end of the seventh day, if you have not cheated on the diet, you will have lost 10-17 pounds. If you have lost more than 15 pounds, stay off the diet for two days before resuming the diet again for day one. This seven-day eating plan can be used as often as you like. As a matter of fact, if correctly followed, it will clean your system of impurities and give you a feeling of well-being as never before. After only seven days of this process, you will begin to feel lighter by at least 10 lbs., and possibly 17. Having an abundance of energy continue this plan as long as you wish and feel the difference. This diet is fast, fat burning and the secret is that you will burn no more calories than you take in. It will flush your system of impurities and give you a feeling of well being. This diet does not lend itself to drinking alcoholic beverages at any time because of the removal for fat buildup in your system. Go off the diet at least 24 hours before intake of alcohol. Because everyone's digestive system is different, this diet will affect everyone differently. After day three, you will have more energy than when you began, if you did not cheat. After being on the diet for several days, you will find your bowel movements have changed -- eat a cup o bran or fiber. Although you can have black coffee with this diet, you may find that you don't need the caffeine after the third day. DEFINITE NO-NO'S - BREAD, ALCOHOL, CARBONATED DRINKS INCLUDING DIET DRINKS. STICK WITH WATER, UN-SWEETENED TEA, BLACK COFFEE, UN-SWEETENED FRUIT JUICES, CRANBERRY JUICE AND SKIMMED MILK. 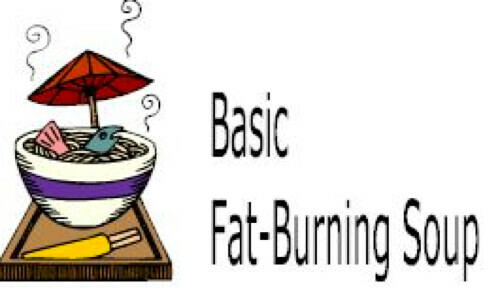 The basic fat-burning soup can be eaten anytime you feel hungry. Eat as much as you wish. Remember, the more you eat, the more you will lose. No fried foods or bread. You can eat broiled chicken (absolutely no skin) instead of beef. Vegetarians can use aduki or mung beans, seitan. Any prescribed medication will not hurt you on this diet. Continue this plan as long as you wish and feel the difference both mentally and physically. If you prefer, you can substitute broiled fish for the beef on only one of the beef days. You need high protein in the beef the other days. One of the best herbal formulas to use during this fast is Triphala. Take from 2 to tablets morning and midday and 4 in the evening. Instead of coffee or tea use a grain beverage. A very good fasting tea is a combination of nettles, chickweed and fennel seed which also helps in weight reduction. There are many excellent green drinks and soya protein powders that can be used to supplement as needed and replace meat. To keep the weight off, replace one meal a day with soup, eat more vegetables. Finish each meal with a bowl of soup. Avoid all those no-no's. Avoid diet soda's and diet chemicals. Use real butter not the hypo- hydrated fakes . Do not use foods with high fructose sugars do not use aspartame or artificial sweeteners, Use natural whole foods, like stevia, agava, honey. Eat good wholesome foods that are well prepared and that appeal to you. Kombucha Tea has been reported to help maintain a person's optium weight. Brewing your own Kombucha and with a easy to use Hydrometer can be a healthy and pleasant tasting diet aid. Most importantly ... Be Happy. Fat Burning Soup has been extremely popular. It is not meant for long term use. Bone Marrow Soup. a classic recipe to rebuild the body after a devastating experience. Longevity Soup. A simple recipe for endurance and peak performance. Mung Bean Soup for HyperTension. Miriam Lee's classic formula to help control hypertension.